This is your chance to support the Alliouagana Festival of the Word. 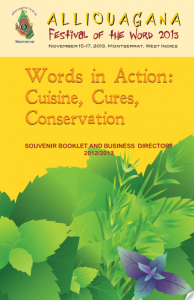 Grab this unique opportunity to feature an ad about your business, send greetings to authors and friends or to publish your poem or short stories in the next Souvenir Booklet and Business Guide. To learn more and to get the advertising rates, please see advertising specifications and the contract below. Click here to get to the advertising contract. You can complete the version in word and email it to us. Look inside the 2012/2013 Souvenir Booklet and Business Guide. You can also see the 2011 Souvenir Booklet and Business Guide, 2009 Souvenir Booklet and Business Guide and 2010 Souvenir Booklet and Business Guide .